Don Brewer was raised on the Pine Ridge and Cheyenne River Indian Reservations. His Lakota name, Wapka, means river. He likens his life to a river. Many experiences have led him to drastically different settings, as tributaries feed a river on its way to the ocean. Wapka was his great-grandmother’s family name. As a child, Don's great-grandmother told him if he used the name Wapka in a good way, he would be helped by the spirits. When Brewer returned to Pine Ridge after four years in the Marine Corps, he began to paint. It was then he took Wapka as his artist name. At that time, Brewer decided to dedicate his life to art. He realized the words of his great-grandmother had been a prophecy. Brewer spent part of his young life attending public schools in urban settings also. During the summers he would return to his mother’s family in Pine Ridge or his father’s family on the Cheyenne River Reservation. The combination of these experiences made a large impact on his life. Through his work, Wapka strives to touch people, especially with the spiritual aspects sometimes hard to reach and explain. He wants to evoke reactions and feelings in his art's viewers. "I was always raised to be proud of my heritage ... I consider myself a progressive contemporary painter; I try to capture the pride and spirituality of my people, blending traditional with contemporary," the artist said. 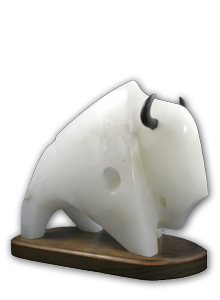 Brewer's artwork is available through the Akta Lakota Museum online gallery.